Who’s Your Daddy? I Am! It’s Father’s Day weekend here in the States, and I have daddy issues. You see, I do not have children of my own, so fatherhood and this holiday are like an exclusive country club from which I have been barred. This doesn’t go to say that I don’t know what it’s like to care for and nurture something, because I do. It’s just that my children aren’t – well, they’re not human. For starters, I have my plants, many of which I gave birth to when I planted their seeds and provided them with food and shelter. And then there are the pets, Murphy and Muffola – two beasts that can push my buttons and provide unconditional love all at the same time. And now, there is this blog, which is rapidly becoming the child that never grows up, the one that demands my constant attention. So, for the sake of this Father’s Day, please allow me to be one of those dads who spend their weekends at the baseball field, watching dance recitals, and/or coaching soccer leagues – and let me brag about my little ones. 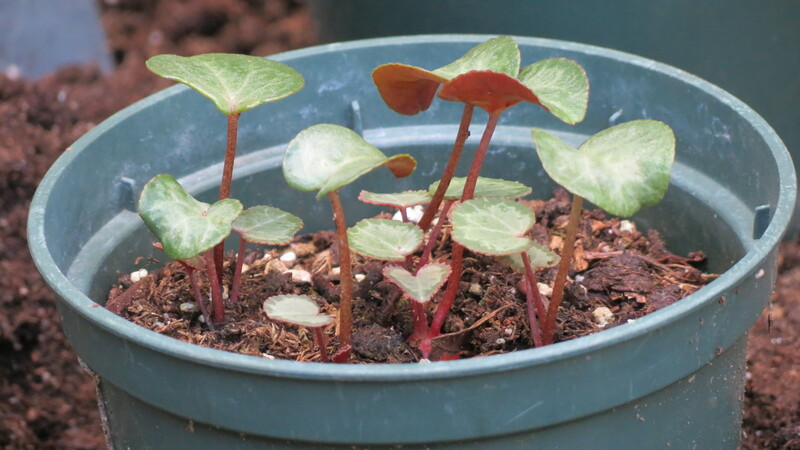 A few weeks ago, for Mother’s Day, I posted a series of instructional photos on how to root Hydrangea cuttings. Since that posting, the cuttings have remained in a sheltered location where I have watered them. 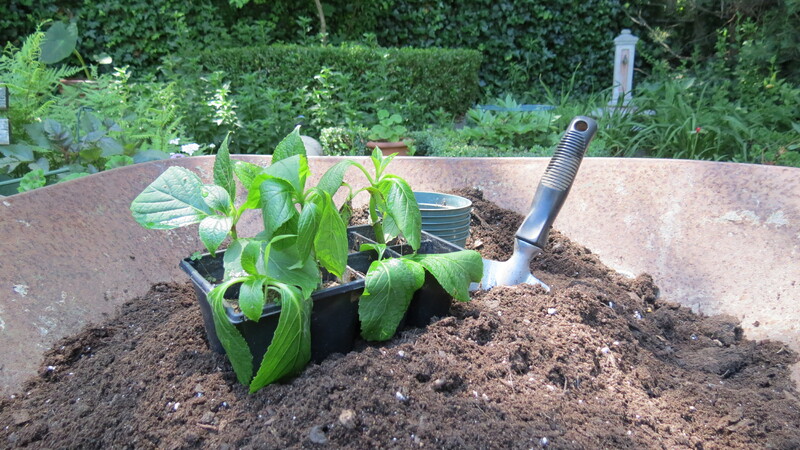 There, they have remained green and some have even grown – a clear indication that something good is happening under the soil and that they are ready to be potted up. Of the original eight cuttings, six survived. 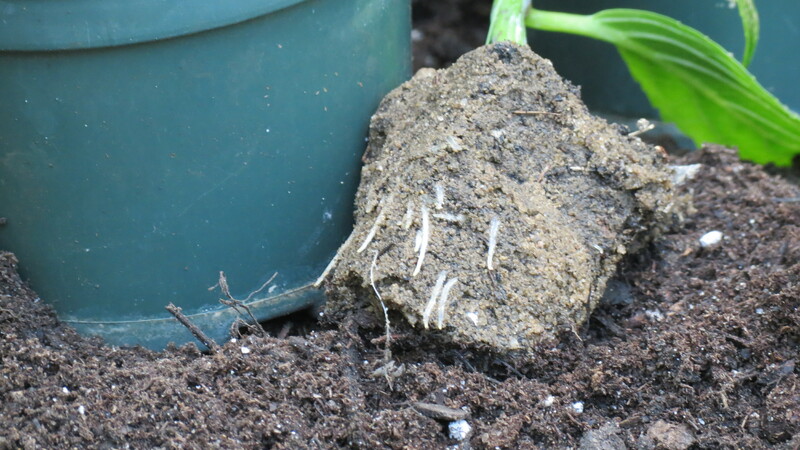 Here is a close up of the root development of one of the cuttings. Apparently, the powdered rooting hormone did its job. 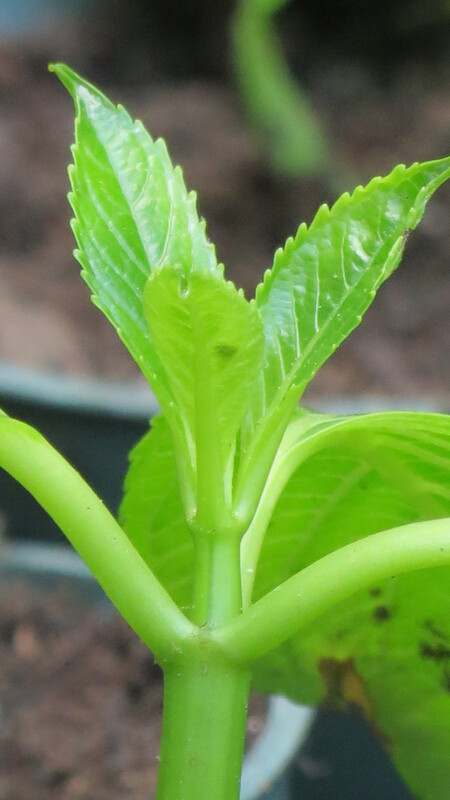 I’m really not concerned if the larger leaves on the cutting are little wilted. What’s more exciting is the new growth. 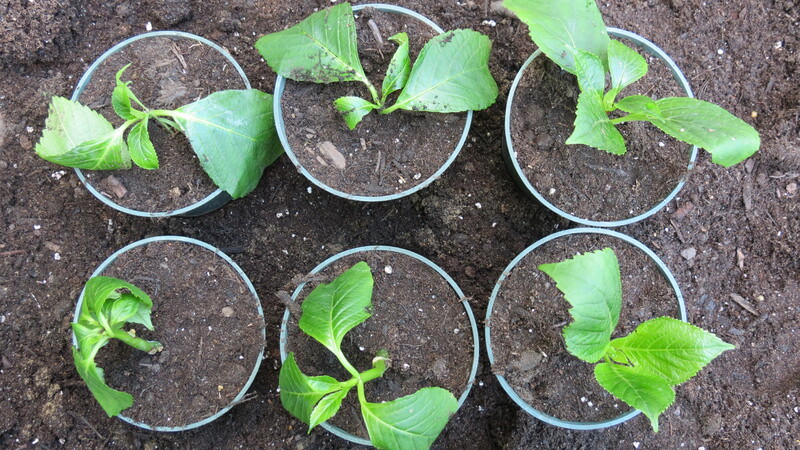 At last, six new Hydrangeas are one step closer to joining the garden. While we’re on the subject of babies and their photos, here is a shot of one of this year’s seed experiments: Hardy Cyclamen. Five of the ten seeds sprouted! And now for Murphy – and the story of the wondrous connections found in Blogtown and a face that not just a father could love. A few weeks ago, Murphy and I went on a coffee date courtesy of Coffee with a Canine, a very original and creative blog for dog lovers who love coffee. Marshal Zeringue, the man behind the blog, asked me to send him some photos to go along with his post, which appeared at the end of May. 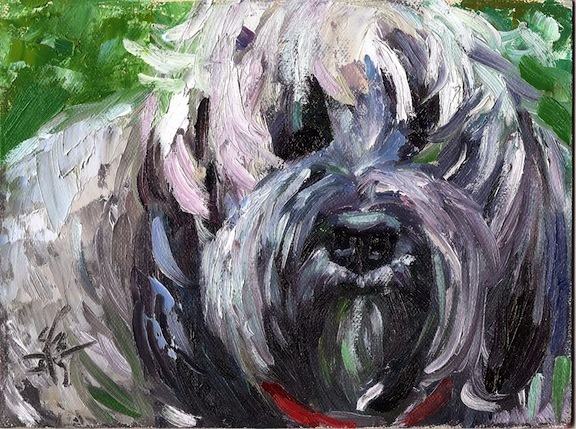 Murphy’s portrait will be on display at the Dorchester Fine Arts Gallery in Dorchester, MD, for the month of July – and a portion of the proceeds will benefit the center and the local Humane Society. So, Happy Father’s Day to one and all – no matter if you are a dad with children, a mom who is a father figure, or anyone who is father-like to anyone or anything. As for me on this Father’s Day, I am one proud poppa. ← Smile, You’re On Arachnid Camera! Hi Debra. I also work in a school — and that feeling for kids never goes away as they get older. I think it’s great that we honor fathers and mothers and grandparents — but maybe we shouldn’t focus so much on the gender but on the roles that we all play. Just a thought. And as for Murphy, she’s doing well — hopping along but definitely not lethargic. Be well! As well you should be!! (A proud poppa!) My husband has been going around his office all week saying “who’s yo’ Daddy?? ?” two a pair of 8 week old kittens! And two of our four Cavaliers are definitely Daddy’s Girl’s. Some of the best children never ask for an advance on their allowance, the keys to the car, never leave laundry piled up or dirty dishes hanging around…. they mew, bark, or simply bloom. You nailed it! Cathy, thanks for the smiles. And from my home to yours, Happy Father’s Day. Happy Daddy Day! You have a lot to be proud of! Great hydrangeas and cyclamen. And Murphy? 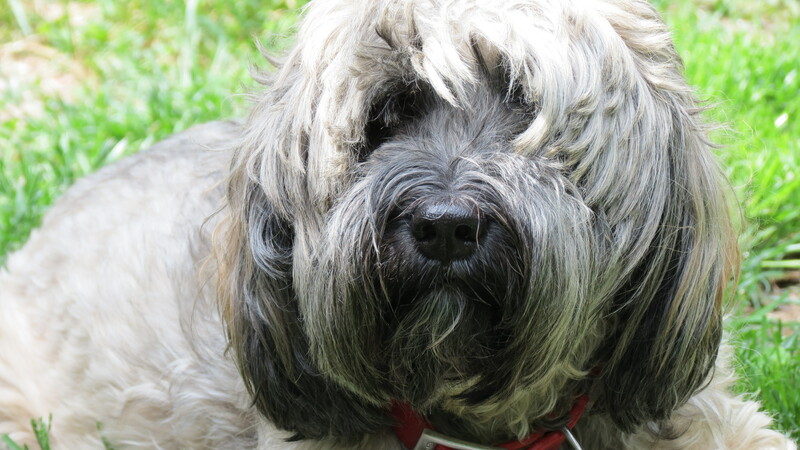 Such a big shaggy Cutie!! (But if he looks like his Daddy, you should consider cutting your hair! Well, at least your bangs…..and maybe that handle-bar mustache 🙂 Have a great day. 🙂 We groomed her shortly after the photo was taken. Now her hair is as short as mine. Enjoy your day! Very sweet blog. I truly enjoy reading it. Hi Stacy. Glad you found me and enjoyed the content. Hope to see you in the future! Thanks! Hope you had an enjoyable day as well. Love the painting of your very handsome dog. It must be ace to be so talented in artistry. Happy belated Father’s Day Kevin, daddy of Murphy. Anyway, a big hearty thanks for posting and linking my site and painting.I am thrilled that you like the image. I am pleased to help the people who help animals with my paintings. And, a big thanks, probably even more, for all these great tips for many of the plants I have come to love but who suffer my neglect! Hope you had an enjoyable day as well. “Liking” the image is hardly the emotion. Joe and I both love the painting — and we are so impressed with how quickly you did it and also how beautifully you captured Murphy’s essence. Like you, I am impressed at how the Internet made all of this possible. It was a magical experience for Murphy and Joe and me. Thanks again! Murphy certainly does have a compelling face, little wonder she was determined to do her portrait. happy fathers day to you. And to you as well. I agree — the painting certainly captures Murphy’s spirit. How sweet! You should be proud of your pup and of your blog, that child that never grows up. I know exactly what you mean. Hi Alberto. Hope you had a Happy Father’s Day, as well, and that you get a handle on your kids’ flea issue. The cuttings are still surviving — and I really cannot wait until their plantable. I know exactly where they’re going, but until then, I’m looking at dirt and weeds. Be well! Not a big fan of pet portraits as I’ve seen so many bad ones…but that one is really beautiful. Love it! Bet it raises lots of money. Glad it’s one that you liked. The artist did an amazing job, and I love that it’s going for a good cause. Hi there. I’m not familiar with the comic, but I’m on my way to the site. Thanks for sharing!